In this blog is a collection of reviews for the teen and tween who is looking for something to read. 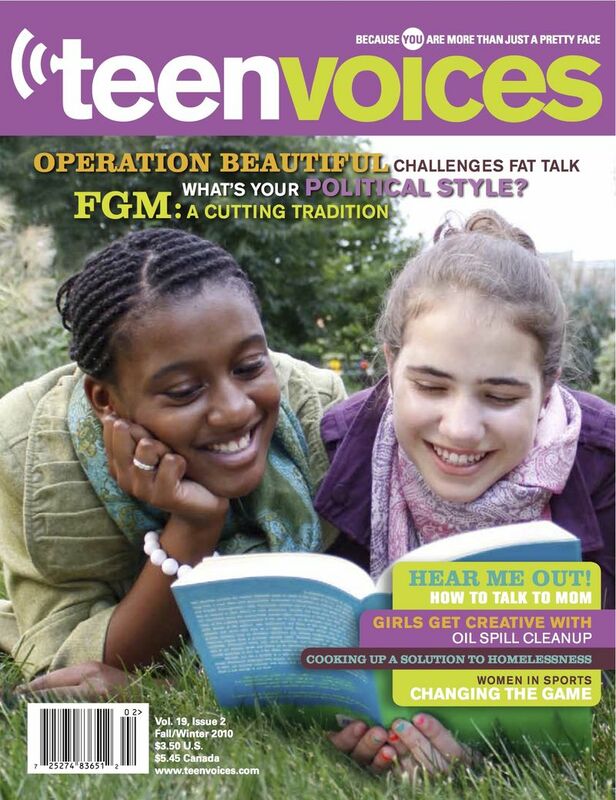 Teen Voices provides adolescent girls with articles about current events, advice, healthy living, and writing opportunities. In the 2010 Fall/Winter edition of Teen Voices there are a variety of articles that discuss women in politics, advice columns, book reviews, healthy living (eating right and dieting responsibly), global issues regarding mistreatment of women, and the accomplishments of teen girls all over the country. Not only does this magazine provide intelligent articles, teens can actually write for the magazine since it offers a mentor program that helps teens not only develop their journalism skills, but provide them an outlet to speak their minds about issues they are passionate about. In comparison to most magazines for teen girls, this particular title focuses on issues outside of the realms of beauty, gossip, fashion, etc. According to Teen Voice: "Teen Voices fills a huge media gap by offering readers down-to-earth stories, statistics, and resources. We challenge the status quo and change the status of girls and young women by presenting a view of girls that is more positive, more in depth, more diverse, and more supportive than mainstream images. Relatively little attention in today’s mainstream media is given to girls; males, for example, outnumber females roughly 3 to 1 in films" (para. 6). The editors of this magazine provide teens girls with an alternative approach to life that actually encourages girls to not only become involved with their communities, but teach them how to respect and care for themselves. This magazine not only provide articles that stimulate the mind, it also provides readers with books reviews and they can submit their works of art for the monthly arts column. Moreover, the featured articles are written by every day American teen girls who just want to make a difference. Teen Voices was founded in 1988 by two women, in Cambridge, Massachusetts. Their philosophy was to empower young girls to not only take charge of their lives, but become examples, and leaders, in their communities through journalism and art to create change. According to Teen Voices: "We help girls achieve personal and community transformation first by providing them with the tools needed to articulate what they know, want, need, and deserve. Through the journalism mentor program, girls learn writing and editing skills, develop critical thinking, and understanding of social justice. They present what they know and learn at speaking engagements and through the magazine" (para.2). My name is Deb and I am a Librarian who absolutely loves to read and recommend books to teen and tween readers. In this blog, you will find reviews on a variety resources ranging from books, movies, video games, and much more. Please feel free to leave any feedback, especially book recommendations!